June | 2006 | The S.E.E.P. I’m in the process of publishing my micro-company’s website with information about my projects and works. So far, I have a sketch of the shipping container concept and details on my one-of-a-kind “music machine.” I’ll be continuing to update as time allows and projects progress. 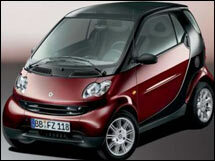 CNN picked up from The Detroit News that DaimlerChrysler is planning to bring Smart cars to the U.S. in 2007. We’ll be getting 46.3 mpg city/70 mpg hwy! Let’s finally start getting “Smart” and catch up with Europe’s emissions standards. 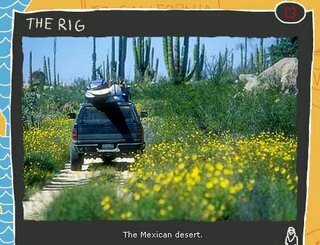 Our favorite clothing company, the uber-ecofriendly Patagonia, has a great flash animated site detailing an Oregon to Baja surf trip in a vegetable oil-powered truck! Complete with the famous Malloy brothers, they haul down the coast in search of killer tubes, leaving a super-green fryer-oil fume trail behind them! Bender from futurama and Al Gore get together for a promo for “An Inconvenient Truth”. Gore admits to driving a “hybrid pimp-mobile.” Sweet! The Sunday paper gets smart on global warming. The Sunday paper insert pseudo-mag Parade had a front-page article on climate change and what we can do about it this week. I’m impressed that more popular media is jumping on the bandwagon. These days it seems that the average American gleans most of their facts from TV and these types of publications which are often affected by politics and other agendas. Peer-reviewed, scientific publications are a far cry from much of what is educating Americans – in “An Inconvenient Truth”, Gore discusses a random sampling of true peer-reviewed journals. Out of almost 1000 of these articles, 0% refuted global warming as a real entity. In comparison, out of popular media articles sampled, 54% included either some doubt as to it’s validity or refuted it. Amazing what can get published without proper research and facts. Well this is my 3rd phone call to PG&E, the power supplier for my home. Since we had solar installed, we’re technically business customers so after an annoying dose of crackling loops of droning hold music, I eventually got in touch with the proper department. So far, when I’ve asked the representatives about “green” or renewable energy credits, I’ve been met with puzzled moments of silence and confusion from everyone. It seems that there is no easy way for a PG&E customer to sign up for renewable energy! The rep should be getting back to me with more information, but I’m frankly shocked and appalled at them for not having this a standard option these days. The more people that demand renewable energy instead of fossil fuel, the more power companies will be forced to invest in green energy research and production, making the whole process cheaper, cleaner, and smarter. Call your power company today! We’ve been making biodiesel for about 7 months now and we’re up to around 170 gallons. We’ve run the ’84 Mercedes “bitty” wagon over 2500 miles on this renewable, clean-burning fuel. The process isn’t anywhere near as difficult as you’d think, and you’ll recognize how much wasteful driving is done when you’re actually responsible for producing the fuel that you use! I’ll be detailing the process on http://theseep.com in upcoming months, but essentially, with a used hot water heater, a pump, some plumbing and a bit of elbow grease (literally and figuratively), you can make your own clean-burning fuel at home. After an initial investment of around $1000 (you can do this MUCH cheaper – I bought a new water heater and had to build a small shed. Plenty of used and cheap parts can be found and scavenged through craig’s list, ebay, and other sources to bring the cost down), the fuel costs around $1.50/gallon to make plus a few hours of time for every 30 gallon batch. The only costs are the methanol (the cheapest I’ve found locally is at J.B. Dewar’s in SLO at $216 for a 55 gallon barrel, which makes 275 gallons of biodiesel) and the KOH (potassium hydroxide) and some maintenance here and there. We’re planning on upgrading to a VW Golf TDI which gets around 50 mpg! http://www.localb100.com/ is a great place to start. Maria Alovert, mother of the “appleseed processor” is a regular poster in the forums and a wealth of knowledge for questions. I attended one of her seminars last year at Four Elements Herb Farm in Atascadero, CA and it really got me going and I’ve been up and running since. A friend that I met there, Rich Tao, DVM has since converted his diesel truck to SVO (straight vegetable oil) and he’s been driving on completely free used oil!